A White Castle Slider at home? Yeah, you can now buy them at the supermarket or on Amazon but its not quite the same. I haven’t been able to get an “in store” white castle slider (or is it slyder?) since moving to South Carolina. The closest thing we have in the South is called Krystal and even that is a state away. There are plenty of Burger tricks and tips out there but a slider is a bit different. This recipe calls for steaming the bun with a special onion mix. Here’s a perfect replica that we made even better by adding a spicy ketchup sauce! Roll out ground beef very thin - to approximately ¼” thick. Freeze patties for a minimum of 1 hour. This can be done several days in advance. Heat grill to medium-low. Using a cast iron skillet or grill sheet pan, spread hydrated onions over bottom, and top with frozen meat squares. Place the bun half on each and top with remaining bun to steam. Grill for approximately 5-6 minutes. Turn once and top with cheese. Build with mustard, pickle and Firecracker Ketchup (recipe below). Top with remaining steamed bun and enjoy! 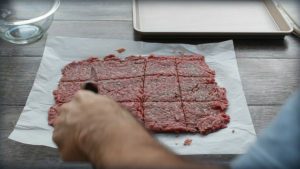 Roll out ground beef very thin – to approximately ¼” thick. Cut into 3”x3” squares and use a straw or wooden dowel to put 5 small holes in each. (Some shrinkage will occur in cooking.) Freeze patties for a minimum of 1 hour. This can be done several days in advance. When ready to cook, hydrate onions in 1 cup warm water and heat grill to medium-low. Using a cast iron skillet or grill sheet pan, spread hydrated onions over bottom, and top with frozen meat squares. Place the bun half on each and top with remaining bun to steam. Grill for approximately 5-6 minutes. Turn once and top with cheese. Build with mustard, pickle and Firecracker Ketchup (recipe below). Top with remaining steamed bun and enjoy! Makes 12 sliders. Stir together all ingredients until well blended and chill until ready to serve.